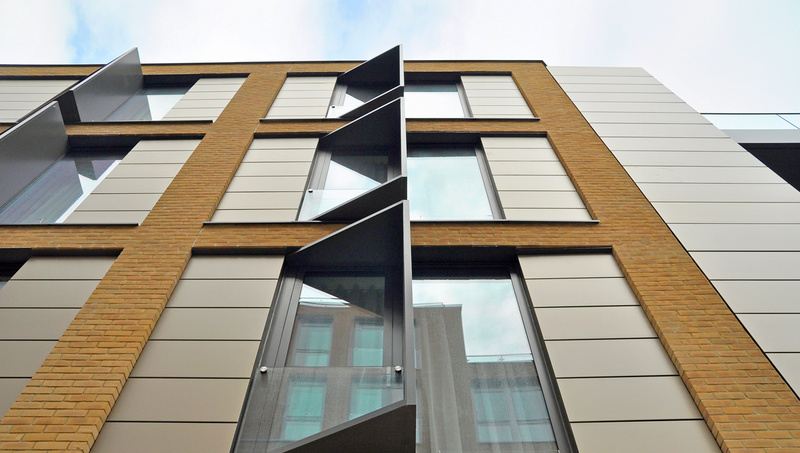 Proteus HR rainscreen panels in a multitude of materials and finishes have created a striking aesthetic on Putney Plaza, a £33 million mixed-use, high-rise development in South London. The designers at award-winning Studio Partington specified richly coloured Proteus HR TECU Oxid panels to embellish and contrast the front elevations of the four buildings. A combination of anodised Aluminium (Anolok 541) and polyester powder coated Galvanised Steel, in three different colours (RAL 7004, RAL 7022 and XDLA 962 Platinum), were used across other elements to compartmentalise what would otherwise have been large expanses of brickwork. 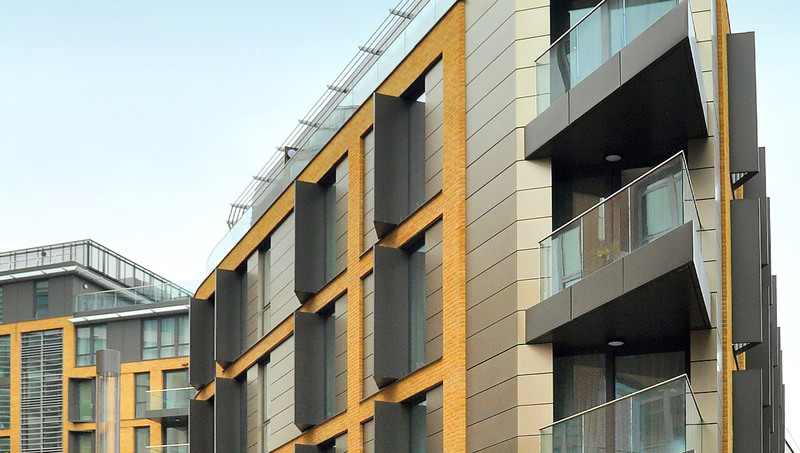 The wide range of colours and finishes in the Proteus HR rainscreen panel system provided the designers with an ability to create four separate blocks, each with its own distinctive and appealing aesthetic. 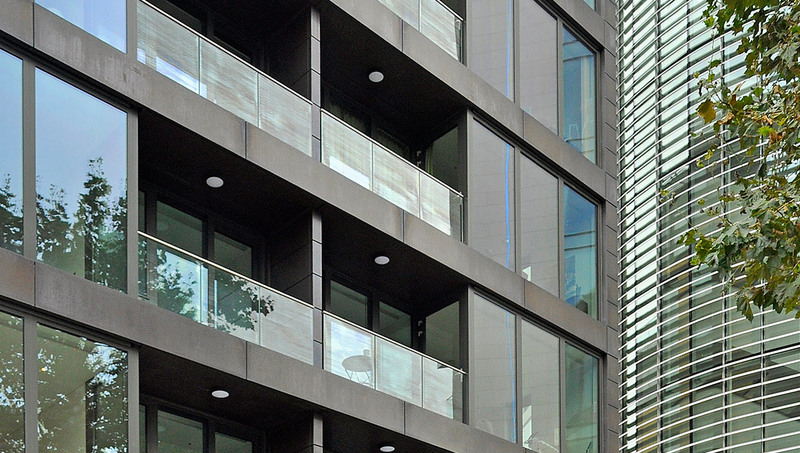 Proteus rainscreen panels make their mark at Putney Plaza in other ways too, through outstanding optical flatness, which shows off the finish to best effect, whilst the tight radii on the recessed joints accentuate the shear, smooth façade aesthetic. The juxtaposition of the façade panels alongside the brickwork and glazed elements helped satisfy the designers’ aspirations for a development with a scale and orientation in harmony with this complex urban site, bound as it is on all sides by railway tracks and a busy main road. 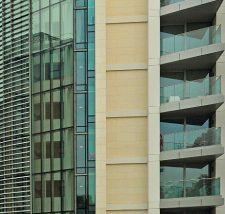 Proteus HR is a modular rainscreen panel system that features an aluminium honeycomb core structurally bonded between lightweight metal skins to create a rigid, sturdy panel with high aesthetic qualities. 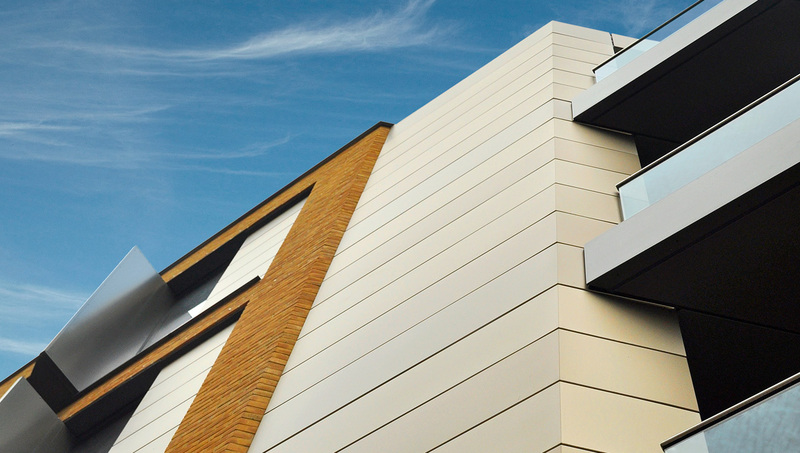 Proteus HR panels are available in a range of facing materials including steel, aluminium, zinc, stainless steel and copper alloys such as TECU Oxid. 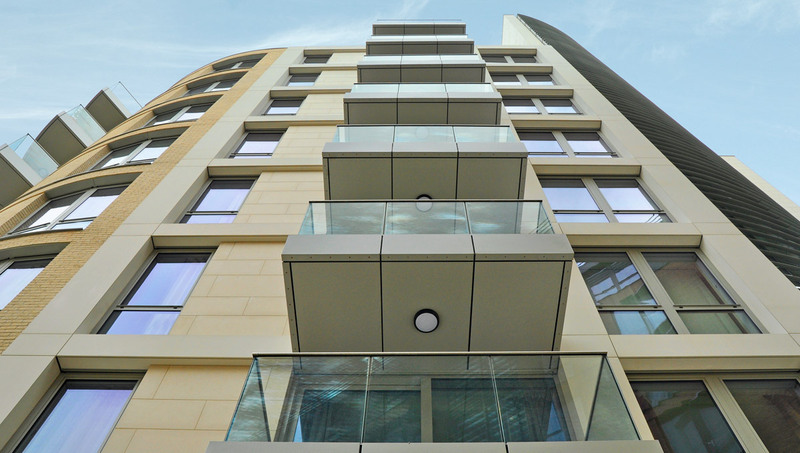 Proteus Facades had to overcome a number of complex challenges at Putney Plaza, specifically with the curved balconies and radius soffits, which required the manufacture of multiple bespoke panels to exacting tolerances. Alongside this were multiple shaped panels that required ongoing collaboration with UK Facades, the installer, and the balcony fabricator, Dearneside Fabrications, to allow suitable support positions for installation of the panels. 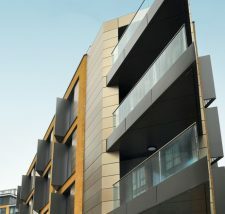 Proteus HR rainscreen panels are supplied pre-finished, which helped to meet the strict build schedule at Putney Plaza. 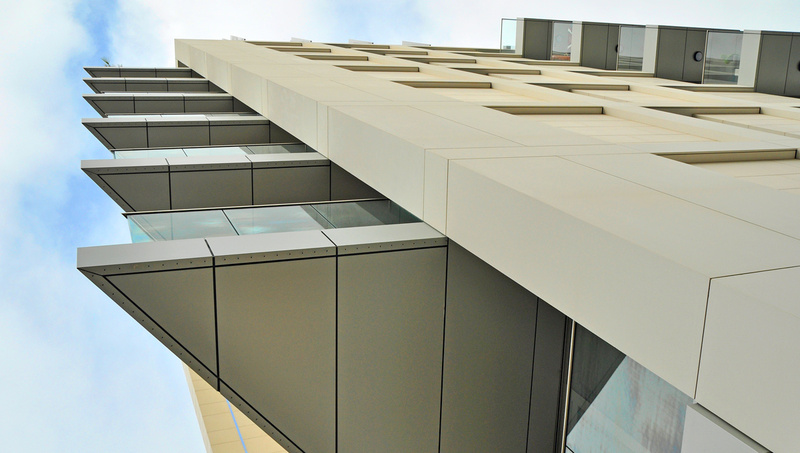 The Proteus’ technical team worked with the cladding installer to deliver and install the panels to the highest possible standards of safety and quality. 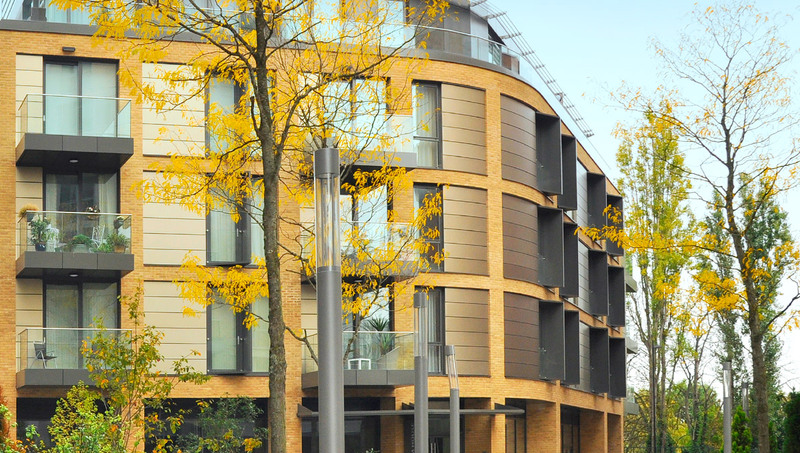 Putney Plaza is a prestigious mixed use development set around a large central courtyard that comprises of 146 apartments and around 20,450 sq ft of commercial area. Each of the four blocks are a different height to ‘vary the scale’ of the development. Art Estates, the client on this project, achieved its environmental strategy by focusing on passive measures, such as minimising energy consumption and high levels of insulation. The Proteus HR system, because the honeycomb core means the panels have minimal density, helped achieve a lower carbon footprint compared to a traditional masonry builds. 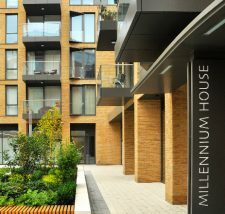 Midguard was the main contractor at Putney Plaza and the installer was UK Facades. Both are part of JRL Group, a £180m turnover company that provides bespoke, turnkey build solutions.